Good news: The Old Republic's framerate issues aren't due to Sith interference and BioWare has a solution coming soon. 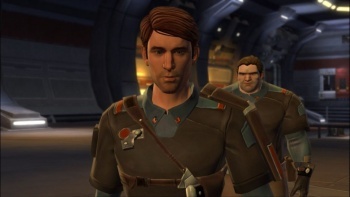 Even though Star Wars: The Old Republic has been a smashing success so far, it's also had a problematic first month. Aside from shipping without activation codes, users suffering through long server queues, and other reported problems, BioWare has pledged to patch the game on a weekly basis. Even though BioWare just released a patch to fix a number of glitches, but it turns out there's already a new problem that the company is scrambling to address: For some reason, a number of gamers are starting to experience major framerate issues when they enter interior locations. The issue has been complained about on The Old Republic's forums, and BioWare has found that it's a legitimate problem with the game. Community representative "Arrthen" recently thanked those who contributed to the thread, noting that "You've provided the development team with a basis for investigation into the low FPS issues, and with your help they have identified and are in the process of resolving the indoor framerate drop." â€¢ Close any and all applications running in the background. â€¢ Turn down the in-game graphic settings. â€¢ Change the settings to favour performance over quality if you are using a third party graphic management software. â€¢ Turning off "bloom" in the graphic options in game. â€¢ Turning shadows off and shaders low.